0:00 Annie: This is join us in France episode 14. Hello, I’m Annie. 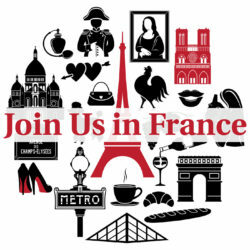 Annie: And we welcome you to the join us in France travel podcast. Elyse is a professional tour guide, art historian, and a really good storyteller. 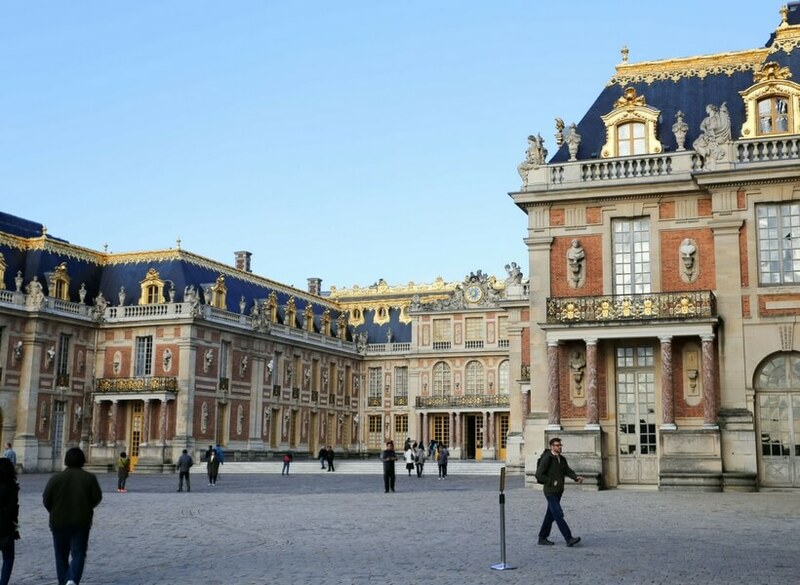 Annie: She’ll tell us about visiting Versailles for a day, give us an overview of what we’ll see there, some historical background, some pitfalls we should avoid (these are always good to know about) and some really good stories about the glory days of Versailles. Now those are fun I think. Elyse: Oh, they’re very much fun. Annie: Now, don’t worry if you can’t take notes, you’ll find our show notes on joinusinfrance.com followed by the number 14. Now we recording this episode on Easter weekend 2014, we’ve released the episode with our appeal for more iTunes review just two days ago, and we’re very lucky that we already have two listeners that went ahead and wrote a review for us in iTunes. Annie: so we want to say thank you John Lopez who says “Vive la France”, how nice, “merci beaucoup pour le podcast” he says he’ll be coming back to France next October, and that he gets more inspired after each podcast he listens to. And we are very glad to hear that. Thank you John Lopez. 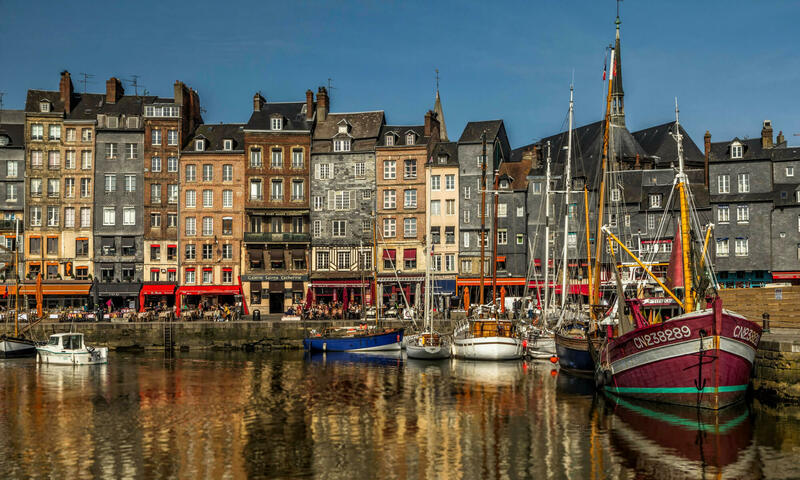 And also thank you to Ozzie in Canada who says: I’m really enjoying this podcast, as it really gives a good idea to both the sites to visit in France, as well as the little aspects of everyday life in France, I really recommend this podcast to anyone who’s thinking about visiting or moving to France. Annie: thank you Ozzie! That’s exactly what we’re trying to do with this podcast so… I’m really excited that we now appear in iTunes new and noteworthy but only for the places and travel category which is, you know, the one we care about, really. Annie: And it’s wonderful to be there, iTunes looks to the number of subscribers and the number of reviews. So we are going in the right direction, it’s wonderful. Don’t forget if you have a moment please write us a review on iTunes and on Stitcher Radio. And that’s all I’m going to say about that. Now will hear the music and then we’ll start talking about Versailles, how about that? Annie: Hi Elyse, how are you? Elyse: I’m fine, I’m so excited that today were talking about Versailles, so… I have a question for you. 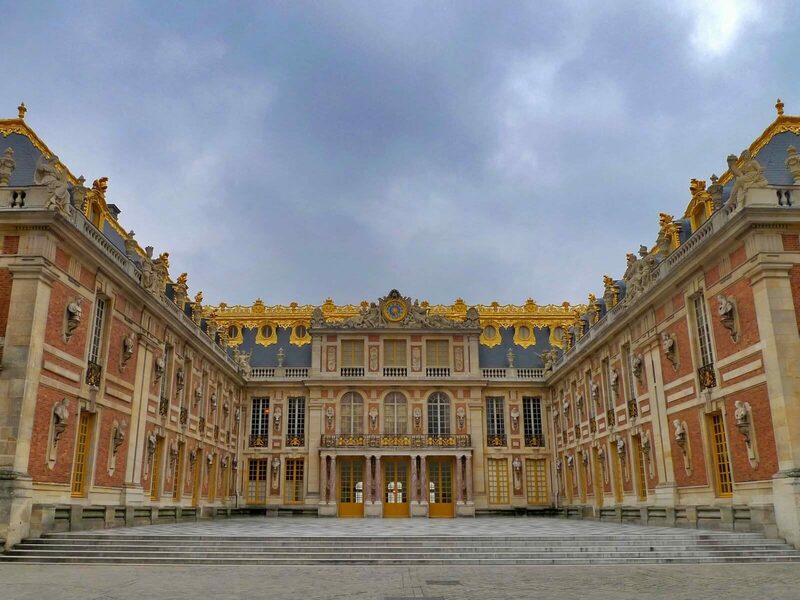 What is the thing you think of or visualize when you hear the word Versailles? Annie: oh, the water, the waterworks. Annie: I saw it when I was little and I loved it. Elyse: you saw when you were little? Annie: no I don’t care about those. Elyse: no you don’t care about that stuff at all. Annie: give me something to look at and I look for the technologically impressive thing about it you know. Elyse: that’s true you and I both took a different things when we look at the world but that’s okay that’s what makes the world go round you know. 3:45′ okay so I thought we talk a little bit about the history and the background of Versailles, which I think most people know is an enormous château, which means Palace basically, and again, the difference between a castle, in the sense of what we’re talking about we talk about historical places, and a château, is that the château is just another word in this sense for a huge palace. And the castle is something which is much older and fortified, and Versailles is not and never was. Annie: and it is huge! Elyse: and it is huge. It is one of, some people say THE most most visited building in and around Paris. But let’s just say it is certainly one of the two or three most visited things in and around Paris. Elyse: it’s true and were going to talk about one of the pitfalls and one of the things to watch out for when you go. 5:50′ Elyse: Let’s just begin with a little bit of background information. Versailles was, in fact, originally a small hunting lodge in the middle of enormous amounts of forest. It’s a very beautiful area west of Paris that is still very low rolling hills, very green, and it was a hugely dense forest area, that was used by the royal family and by the kings to go hunting. For centuries hunting was considered to be a sport of the kings and the entourage of the kings. If you are poor person you were certainly not allowed to go hunting on the kings grounds, you could be killed for poaching, I mean it was a very very serious kind of thing. And there was a king namely the 13th, we’re in the period of the Louis now right, okay, we’re going to stay with the Louis. It’s like what I like to think there’s got to be a rock song Louis, Louis, Louis, that has to do the kings of France. But, though it is 13th went to this place called Versailles as a hunting lodge, loved it, and decided it would make a wonderful small château. As a place that would now consider to be a country home outside of Paris, and this is in the early 1600s. Early and middle 1600s. And of course the main place where he lived was at the Louvre in the center of Paris. 8:00′ Louis XIII decided it was time to build something more elaborate more extensive than this hunting lodge and he hired some of the best architects and engineers of the time and the cleared away some of the forest to make what was the first section of the château of Versailles as it stands today. And he didn’t have great ambitions for it he just wanted something that was beautiful to look at, not very big, but that was a nice place for him and part of the court to stay outside of Paris. I think he was kind of tired of all the shenanigans that were going on in Paris at the time there was a lot of plotting and all kinds of stuff like that. Annie: well and it’s a very French thing to do, you have a permanent residence and then you have some other place you like to go to. Elyse: that’s true that’s a very French thing to do even today, even people who were not very rich. 9:00′ Elyse: so in 1631 he actually began the building of the château of Versailles, and it’s was made in the style of the time which was the modern style of the time interestingly enough; which was a combination of stone and brick, and very steep slate roofing. Very typical of some buildings that you can see in some parts of Paris. But it was the style of the time and he wanted to be very fashionable. And he spent a good deal of time out there but his permanent residence was still in Paris. But it wasn’t Louis XIII it was his son Louis XIV who became king when Louis XIII died. When Louis XIII died he was not that Young and and of course in those times if you live to be 55 or even 50, you are not considered to be very young. But it happened that he had his two sons very late in life, so Louis XIV was only a small child when his father died. With the 14th was under the control of his mother, and she kept him in the palace in the Louvre in Paris. And when he became king officially was in 1661, and by the way, you became king at the age of 14 that’s when you were considered an adult at that time. Annie: wow 14? Yeah well I don’t know too many people who want to be ruled over by a 14-year-old. Elyse: well of course at that time 14-year-old student go to junior high and weren’t all walking hormones, you know what I mean? Annie: well I’m sure they were walking hormones all the same. Elyse: well, in the way they were, but they were raised from the age of three knowing that they were going to be the king; they were raised with a certain protocol, and it was quite different. But obviously at the age of 14 you still have to have advisers, I mean, you don’t do everything on your own. Annie: so was she is a “régente” or something? Elyse: yes she was a “régente”. And you know she was originally from Italy anyway and when Louis XIII died she took over the reins of power and she and her advisers were very very controlling. And Louis XIV very early in his life decided he did not want to be suffocated by this kind of control. And at one point he actually asked his mother politely to go away go to a château where I can’t see you I don’t want to have you around anymore. And he made a decision that of course change the future of France for ever and ever, he said he was going to stop being the king who moves from Castle to Castle, he was going to decide where he was living and from that point on everybody would come and see him. And he dismissed the advisers he stopped having an official prime minister or major advisor, and he said he was going to make all the decisions, he was going to be the one to run everything. And in order to do that he wanted to a place where other people could come and live, and there would be space for them. So this is what he did, he went to Versailles, which he knew I assume as a place to go for short periods of time, because he had been taken there all his life, and he said there so much land around here this is what I’m going to do I’m going to make this place my official residence. This is going to be the residence of the kings of France from now on. And we were going to make this so big that whoever wants to be part of the court can come and live here; and people will come here, I’m not going anywhere from this point on. 13:05′ Elyse: and so what he did he hired the very best of the architects and landscape designers, and painters of the time, and he proceeded to take an enormous amounts of money, and built this phenomenal absolutely phenomenal château. Annie: it must’ve taken huge amounts of money, I mean it oozes money that place. Elyse: of course it oozes money, it oozes everything, because he not only took money from taxes that he accumulated from every part of France, but it became a sort of bleeding of the people of France to finish the building of Versailles. Now it is true that at any given time, once the building was established because there were some other buildings on the exterior are at the other end of the park, but we’re not talking about that, were talking about the main château itself, when it was finished it housed probably three or 4000 people. Annie: yeah that’s a lot, it’s a big place. Elyse: this is a lot of people, it housed all of these people, because not only did the king have a huge entourage, he had accounts and princes and all kinds of people who came; but anybody who wished the favor of the king, could come to the court. Now obviously, if you are poor poper, if you were Baker, you might not have the statute to come to the court, but theoretically the doors were open. There were specific hours every single day, where people lined up and down the huge galleries, that make up the château; and little by little, he received every single person. Annie: yeah, that sounds contradictory because, I mean, the way you described him he sounds like a control freak, but at the same time he wanted to hear from his vassals I guess. Elyse: well, it wasn’t even vassals anymore, these were really post-feudal times, there’s a vestige of feudalism in the fact that you have nobility all over France. And there’s a hierarchy on the nobility, you have ranking like you do in the military, but in fact, it was more like by centralizing the power, and having people come to him, he had absolute control over what happened. And the person that was the most important, was not a prime minister who gave him political advice, it was his finance minister. His finance minister who was a man named Colbert. And Mr. Colbert who was in fact not from a noble family, but was a very astute intelligent man, he was the one that Louis XIV talk to about “do we buy this?”, “do we spend this money?” But basically Louis XIV decided everything absolutely everything by himself. 16:04′ Elyse: So, little by little, he hired some of the most famous architects, he hired a man whose name is Le Notre, and Le Notre became the most important, and really historically, probably in France, the most important for ever and ever, landscape gardener. He’s the one who created all the designs for the park that surrounds the castle, sorry, that surrounds the château. And one of the architects he hired was a man named Mansard, and I was mentioning to you the other day, in French and I don’t know in English, had we talk about Windows that are in, what looks like the attic? We have very steep roof and you have a window jutting out, and we call that in French it’s a Mansarde window. Annie: yes it’s a Mansarde window, in English it’s a dormer window. Elyse: yes, it’s a dormer window. Well, it was created for the château. Annie: Yes, and it’s very characteristic of that style. Elyse: and became, because it was the King’s style, it became very popular with lots of other buildings, especially in Paris itself, that of course, copy the styles afterwards. So, what happened is that, little by little, Louis XIV reigned for a very long time. I should have the dates in front of me, but I don’t, but if I’m not mistaken, he reigned for over 50 years. He reigned for an enormously long time. I mean he reigned so long that Louis XV was not his son, he was not his grandson, no, Louis XV was his great grandson. Annie: oh yeah, that’s a long time. Elyse: Louis XIV actually outlived his son and his grandson. It was amazing, so he had an enormous influence not only on the country in terms of its politics and in terms of the economy; but he also had an enormous influence on the arts and, this is also one of the reasons why, there sorry has stayed so important. He had Molière come and perform for him in the château. Annie: I wish I could’ve seen that! Elyse: oh yes, so do I actually. Annie: oh yes Molière in the château, that would have been amazing. Elyse: not only that! But did you know that Louis XIV was an incredibly good dancer? Annie: yes I have heard that. Elyse: he was tall, at the end of his life he was not very good-looking anymore because, like most people in France at that time, he did not take very good care of his teeth. So he apparently tried not to smile at the end of his life because it was not very pretty to look at. However, he was very tall, he had great allure, apparently a wonderful dancer, and the choreography was sometimes designed so that he could be the start of the performances. Annie: yes, at school, my daughter said that at school one of the sections they did in history was on Louis XIV and the teacher make them dance. Make them dress up and dance in the fashion of Louis XIV. Elyse: I would’ve loved to be able to do that! 19:20′ Annie: he reigned for 77 years. Elyse: well, that’s how long he lived. Annie: no, he reigned from 1638 until his death in 1715. So that 77 years. Because he started really young. Elyse: he started very young. Well, that includes when he was a baby though when he was under the regence of his mother. Annie: oh, probably, yes yes! Elyse: yes, he had the longest reign in the history of France. He and Queen Victoria, I think, are the record setters in terms of the amount of time they reigned over country. And so, he had composers, he had people like Molière come with theater, he had painters, a man named Le Brun (Charles) who was a very famous 17th-century painter in France. He had all the most important artists, designers, architects, landscape architects, he had engineers come and create the system of fountains and canalization that went into create these beautiful lakes in the park. All of this was the incredible flourishing of the arts under Louis XIV. Now, just a few statistics, just to give people an idea of the size of the château. It has 700 rooms. Elyse: don’t worry about it, if you go you’re not going to see more than about 25. Elyse: and believe me, by the time you’ve gone through the 25, you will have a very good idea what the château is like. There are 67 sets of stairs, over 2000 windows, and this is in the main château. This is not at the auxiliary buildings that are at the other end of the park. So, the château was the building. But Louis XIV wanted to create some place that would be so magical, and really this was the idea: that it would be something like a magnet, that it would make people want to come there. It would show the power of the French king, who at the time was extremely important in Europe anyway, the riches of the French king, and his good taste. See, that’s the other thing, Louis XIV wanted people to know how much he was a patron of the arts. And so, he asked the designers, to make the park. Now, when I say park, where talking 800 ha. Annie: yes, it’s very large. Elyse: 800 cars, you just have to multiply by 2.2, to see how many acres that is. We’re talking 2000 acres. 2000 acres of grounds, 20 km or, what is that?, 12, 13 miles of roads inside the park. Over 200,000 trees and bushes. And they are viewed planted and taken care of all the time. Annie: so did they change the structure of the park very much? Or, did it mostly stay the same and they just keep it going? 22:30′ Elyse: no, the actual structure that you can see in terms of the park is the original structure. It went through a period of time when it was left in a bend in a little bit. Or it wasn’t that well taken care of. But basically in the last 50-60 years, starting in the middle of the 20th century after World War II, an enormous amount of money was invested in reestablishing the park, the way it was originally designed. Part of that money by the way is American money. The Americans, Jackie Kennedy, and a lot of other Americans were very important in raising huge amounts of money, the Rockefellers as well, to put back things into the park and into the château. The park was never destroyed, the château was never destroyed, but it was left in a relatively bad condition, and the furnishings were taken out, first after the French Revolution and then little by little things got a bit dissipated so that it was not in the greatest condition. But during the time of Louis XIV it became famous all over Europe. People would come from other countries, just to come and see what this fabulous place looked like. Of course, Louis XIV, who was a great fan of mythology and who, as I said was a great dancer, he became known as the Sun King. And the Sun King, he had all the major Windows of these fabulous rooms, especially the incredible space called the gallery of mirrors. Annie: it’s truly stunning. On a beautiful day I think it would be so lovely to spend the whole day just walking around the grounds. Elyse: oh, you can do anything. Now, inside the château, what happened strangely enough is that after he died, his great grandson was Louis XV, he lived there, and then his grandson Louis XVI who unfortunately for him was the king who was assassinated who was guillotined during the French Revolution, he and Marie Antoinette, and during the reigns of Louis XV and XVI, which were not as long, well, Louis XVI was certainly not as long at all, but they added some buildings they added some small buildings that were at the other end of the park. Some of them were added by Louis XV who wanted to get away from the immensity of the château. And he wanted a place where he and his wife, and eventually his mistress, would be able to go and just be alone for a little bit. It was a very strange thing because up until the end of the 18th century into the 1700s there was very little idea of privacy for kings and queens. Everything was done in public. And when I say everything I really mean everything. Really! Elyse: and the king peeing! Annie: Peeing? Why on earth would you want to see that? Elyse: well, that’s another whole story, we have two talk about the customs in the old days in the customs now and things like that. But it’s very interesting that some of the buildings that were built at the other end of the park, were built to maybe get away from this you see. And then Louis XVI was married to Marie Antoinette. Marie -Antoinette was the youngest child of the Empress of the Austro-Hungarian Empire, and she was brought up in an atmosphere, obviously she was spoiled she the daughter of an impress, but, she was not used to this kind of public life, and she was basically very unhappy. Whatever else you want to think of her and her politics, and she asked her husband to have two little buildings built. One was just a little bit of a house, so she could get away with her closest friends who work countesses. Annie: is that the Petit Trianon? Elyse: that’s the Petit Trianon. Annie: yes, that was lovely, so cute. Elyse: and the other thing is she built a farmhouse. When she had animals brought in, and she would come out and pretend to be a Shepherdess. Elyse: this was how she kept herself from being bored to tears in the protocol of the château of her side. Annie: but I bet to the people they probably came across as in other crazy extravagant idea that the kings had. Elyse: well, interestingly enough, things were always extravagant, and of course, you know, we’re talking about what made this fabulous. But, starting with Louis XIV, there were problems all over the country, because all the money was siphoned off from everywhere to build Versailles, to keep Versailles up, to make sure that people were coming to Versailles. Annie: I bet, even to this day I cannot fathom, imagine the French president, or the American president, for that matter, deciding “OH! I’m going to build myself a fabulous place, something the likes of which you have never seen, and it might never see again” you know, it would really come across today as outrageous. And probably, it did at the time too. Elyse: well, it did, it did at the time too. And of course there were some regions of the country, that were overtaxed, and this is of course the beginning of the rumbling that eventually led up to the French revolution. It really started with this, so, in some Ironic Way, Louis the 14th, who became the king that represented absolute power, what they called the absolute monarchy, he also eventually set the stage for what became eventually the French revolution. Which of course we all know was really inspired by the American war of Independence, but that’s another whole story, it really is. Annie: but yes, I do know that. Elyse: but, what’s interesting about Marie Antoinette, and I’m not defending her on some some level, it’s interesting to know that she in fact, was considered to be a foreigner. She was never accepted at the court. She came to Versailles the age of 14 to marry Louis XVI and nobody ever liked her, from the beginning. And, she really had a really hard time. So, when she built these of the buildings, since she never thought twice I’m sure whether it costs money or not, that was never part of the things that would go on in her head to begin with, you know, it was mostly just to get away from this incredibly stifling world and this incredible protocol, but of course that was the way Kings and Queens lived with that kind of luxury all the time. 30:00′ Elyse: Then of course we get to 1792, and the Royal family is put in prison, the revolution had started in 1789, but like with all revolutions, there were two different factions, and one faction basically simply wanted to make into what would be considered to day to be considered a constitutional monarchy. Like pretty much what exists in England. And then, there was the faction that was far more extreme, that wanted to eliminate not just the idea of monarchy but all the people that were part of the Royal family. Annie: off with their heads kind of thing. Elyse: but they took all the furniture out. And of course there were squatters, you know in the Louvre there were squatters too. And people came and lived in the Park, well the Park is so big that of course it was very easy to move in and make little space to sleep in the Park. But, it was saved by Napoleon. See, Napoleon, that another whole story of course but, of course, Napoleon was first a lieutenant in the revolution, who was a revolutionary, and then when he saw the turn the revolution was taking, he stepped in and actually created a coup d’état, ended the revolution, and took back Versailles. And he moved into Versailles! Annie: he did? Oh! I didn’t know that! Elyse: oh yes, actually there are several rooms, in fact I think the rooms are in the big Trianon one of the two small mini Château that are at the other end of the Park, that became his official residence. Annie: oh! Wow! That had escaped me. Elyse: he really wanted to, well you have to remember that he really wanted to be considered to be in the lineage of the monarchs. Annie: oh yeah! In his head he was a King! Elyse: he was a King! 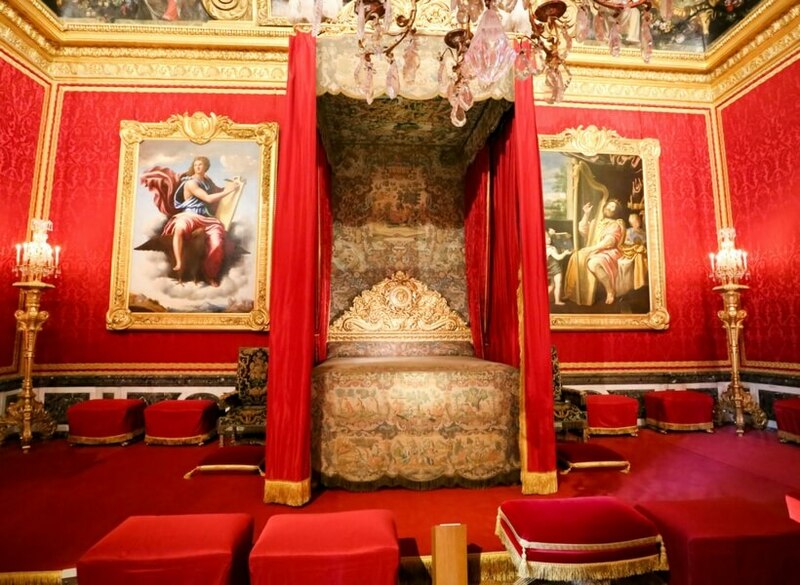 But, interestingly enough, he was more modest in terms of, he used the main Château of Versailles, but basically he slept in the smaller one at the other end of the Park. And of course, that really did save the Château. Now, of course, Napoleon came, Napoleon went, there was a restoration of the monarchy, and then Napoleon came back, and then there was another restoration of the monarchy, and the last King was basically in the middle of the 19th century. But the last King to use Versailles was really pretty much about the 1830s. And from that point on, it started to be considered as a Museum. But it was a Museum that needed to be re-furnished. And it was very difficult because all the furniture had been either destroyed or stolen. 33:15′ Annie: it’s probably all over France today. Elyse: well, some of it is in France, some of it is in the United States, and a lot of it was actually destroyed. So, the furnishings that you see when you go to the Château now, interestingly enough, I either exquisite accurate copies made by fine furniture makers, based on the designs and drawings that people knew existed. Or, there are pieces that have been hunted down, and usually paid a lot of money to get back to bring them back into the Château. But a fair amount is actually the reproductions. Elyse: it’s already been a long time! Annie: 25 years ago or something, 26 years ago? Yeah, we’ve been married a long time. And, I had the impression that it was empty. That it was over the top gold and decorative and… But empty. Elyse: you mean the Golden all that meaning of the walls and ceilings obviously. Annie: yes, yes, yes, the wood, all the beautiful moldings or whatever that they had everywhere, I mean it was over the top. Elyse: yes, it is over-the-top! It is over-the-top! But it is not empty anymore. Annie: that’s good to know. Elyse: so, this is the thing, really, in the last 35 years, there has been an enormous amount of money invested into bringing back Versailles to what it was before. To this day, and I’m saying literally to this day, when you go into visit the Château, you will find people working on the restoration of the wall, of a piece of ceiling, on a piece of furniture, while you walk-through the Château. Annie: so, they’re still working on it all the time. Elyse: all the time! And, in fact, the last time I was there, which was just a couple of months ago, two three months ago, I actually stopped and asked to people who were working on the walls in one of the rooms, and I asked them how they can work like that because you have masses and masses of people, and we’ll talk about that in a minute, going through the Château at any given time, and they said that they have no choice, that the work has to be done, and that every single room has work that needs to be done, and so they’re constantly working on something. If they’re not working on replacing part of the floor boards, in the original beautiful wood, they’re working on replacing some of the plaster decorations on the wall, or the textiles that are on the wall, or the painting. So, what has happened is that, Versailles is not the victim of its own success. That means that there are so many people that go through all of the time that it is packed almost all the time. And, these people who were the people who do the restoration work they literally work almost 24 seven. Because there is no other way for them to get things done. And they have to deal with the crowds, and they have to deal with the noise, and of course it’s reciprocal, because it blocks up some of the places, and it sometimes makes it difficult to manipulate your way through the Château. 36:45′ Annie: well, that’s a blessing and a curse that we have in Europe, we have so many old buildings, old churches, old everything. And, all these things have to be kept up! And, you know, you mentioned the Rockefellers and the Kennedys earlier, Jackie Kennedy in particular that they were very generous. And, thank goodness! Because we just have so many monuments to maintain, France is a pretty rich country, but not rich enough to keep all of that up. It would take crews of a couple million people to do it all. And we don’t have that many trained people to do this, it just takes time. Elyse: and you know, the people who have the rights to work on a historical monument, whether it’s a church or a palace, they are called the Compagnons. A Compagnon is the modern equivalent of someone who was part of the guild during the Middle Ages. They must trained for 10 years! And they must go from historical monument to historical monument. Now, this could be someone who does the roofing, someone who does carpentry, someone who does stone cutting, someone who does painting, it does not matter, these are the only people allowed to work on those buildings. And they cost a fortune. They are highly trained. I mean, for someone who has a passion for a job that involves some of the things it’s one of the most wonderful things you can do. Annie: I know a couple. And I’m not, you know, into the arts scene, I know a couple of people who were official restorers of monuments and art and I know their super smart, they have PhD’s, and and they’re also very very good with their hands! Elyse: it’s very special, so of course it cost a fortune. But let’s just, and overall idea, you have the Château with all these 700 rooms, remember that you don’t see that many of them, the entire Château, not the grounds, just the Château is 67,000 m², that is beyond anybody’s comprehension, it’s kind of like talking about going to the next galaxy, okay? There are only ever about 15,000 m² that are ever open to the public, and in the general visit, which is the visit that most people do, you don’t even see the 15,000 m² so it’s beyond imaginings in terms of its size. Elyse: well, what they have done, and Versailles is basically an ongoing project. Just to mention that, I have been back to see it a lot in the last several years, and every single time there has been a change. Because they’re in the process of doing some remodeling on the entrance way on where you go in, on where you go out, on various things like that. 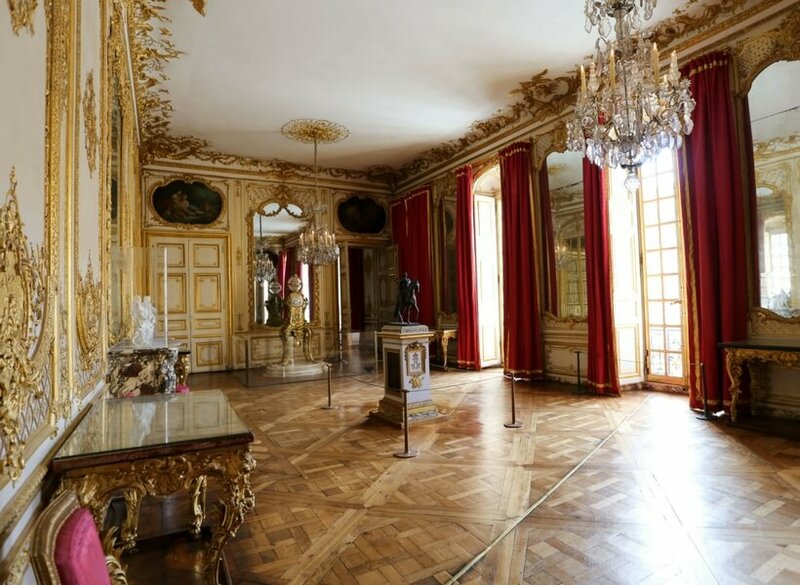 So, basically, when you go to visit the Château, as opposed to visiting the Château and the Park, but just the building itself, the Main building, you get to see several of the rooms where the King and the Queen slept, you get to see some of the reception rooms, you see the gallery with the mirrors. It has been restored, it’s absolutely magnificent to see, and you get to see some other rooms. That is really the sum total of what you see in terms of the intimate rooms where you see the original furnishings, the textiles on the walls, some things like that. Annie: do you get to see kitchens and things like that? Elyse: no, not at all. Annie: a lot of Château was in France, you do. Elyse: yes, but first of all those are obviously much smaller ones, and they are very often feudal castles as opposed to Châteaus. In this case what people are guided through to see, are the rooms that were basically the rooms of reception life for the monarch. And so what you see, and then of course, you have to walk through some sections that are these enormous galleries where you have a series of sculptures, because you have to go from one wing of the Château to another, because they keep changing some of the rooms that are open. There certain rooms that are always open. You have the King’s private chapel that is available to see almost immediately when you go inside and you can see it from downstairs and then you can see it again from upstairs. 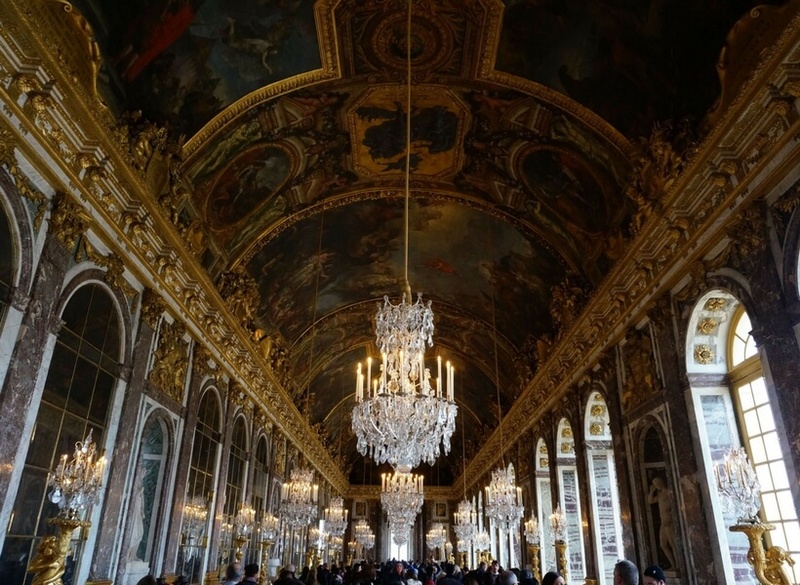 You can see, as I said, the gallery of mirrors, which is one of the most famous pieces in the entire Château. And you see the King’s room and the Queen’s room and various other rooms. The thing is that the design and architecture of the building like that was such that you have on one side of the building a very long, of what we we would consider to be the hallway that opens. The rooms are linear, you go from one to the other. Annie: yes it’s called “en enfilade” isn’t it? So that there all strung up together. Elyse: it’s a string, so of course what that is is that, when you go in, and by the way one of the things I think that is really good, there are some problems with visiting Versailles that have to do with various elements, that have to do with the overcrowdedness and things like that, but now the ticket includes a free audio guide, and it is absolutely essential, if you’re going to appreciate visiting the Château of Versailles, you must take the audio guide. Because it gives you a very good complete explanation of the history, of basic history, in the first two or three rooms you see the history of the building of the Château, and you see, it’s kind of like two PowerPoint presentations that you get to see there are flashed on the wall, they’re trying to make it a little bit more modern so that you you get an idea of what you are going through before you do, then you go upstairs. And downstairs you can see the King’s Chapel, which he went to, he had mass in the chapel every day, every morning at 10, and then you go up these fabulous stone stairs, it’s one of the staircases, you go through this series of decorated furnished rooms, and that is the general basic visit. Then, you can take the audio guide and if you pay some extra money, you can do and extra visit to another section, and then you can even do another visit if you that you have to pay extra money for if you want to do it with a local guide in the Château, but you don’t really need to if you do the audio guide. Annie: obviously the audio guide is in English and many other languages. Elyse: it’s in every language in the universe! I think at this point whatever it is that you speak, the most dominant language is English, and now the second of course is or used to be Japanese now it’s probably Chinese. That’s the visit to the Château. 44:00′ There are two or three little shops, they are also changing that around, because there are a couple of little small stops that are along the way where you can buy souvenirs or some books about Versailles or little things, nice little things actually, but little things that you can take as souvenirs and they are in the process of re-creating a café downstairs. So right now inside the Château there is only one café and that is an Angelina café which means you spend a fortune for a tiny little espresso. You spend about five dollars for tiny little espresso and a macaroon or a sandwich, I mean it’s extremely expensive and not very big but, if you want to why not? It’s also one of the two places in the Château where there are toilets. And that’s one of the problems with the Château is that when you start going through you can’t make a Huey and go back the other way. So, before you go in, now they’ve put some toilets downstairs below street level, which means you have access to them before you start your visit to the Château. Annie: is it wheelchair accessible by any chance? Elyse: I don’t remember. Probably it will be because they are bringing it up to norm but I remember going down the steps with some of the people last time but I didn’t pay attention, but if it wasn’t, it will be by the time any of the people are listening to us because they were in the process of fixing all of that up very soon. And there’s this other set upstairs at the Angelina café. But basically what it is is, it’s impossible to turn around and come back. That’s why the audio guide is good because it you have to understand that you are going to be there with a lot of other people and if you want to have the time to really look and listen to the audio guide, you will have to let all these other people basically push around you and move out because it is really like that. This is really a place that thousands of people go every day, and obviously there is a high season which is the summertime, and I was just there in the winter and really there were a lot of people but it was nothing like what it is like in the summertime. 46:10′ In the summertime, talking about visiting Versailles, at 9 o’clock in the morning there are already about 50 tour buses lined up in the huge parking lot in front of it and the line is enormous. Buy your ticket ahead of time. 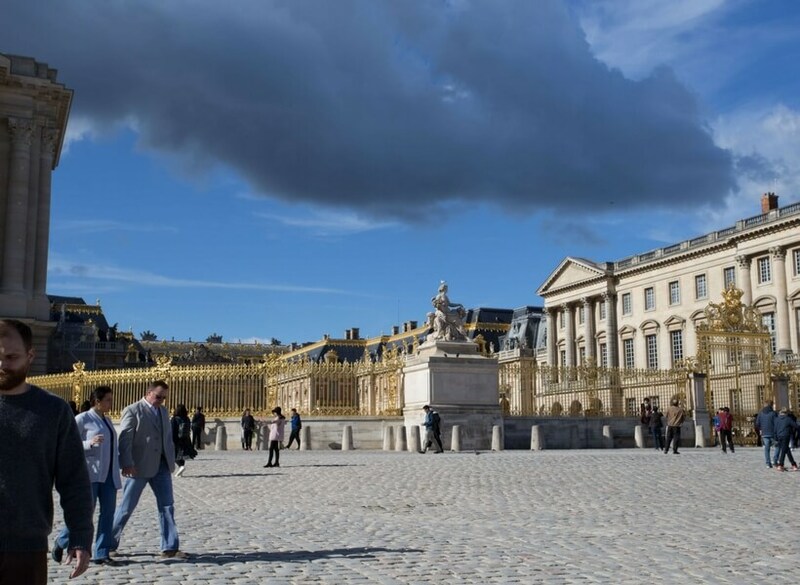 By your ticket ahead of time online or if you are going to spend two or three days minimum visiting museums in Paris buy a Museum Pass which includes Versailles. Because theoretically, and I say theoretically because I’ll explain in a second, but theoretically there are two lines one line for the people who already have tickets, which is true of all major museums, it’s true in the Louvre it’s true in Orsay, the line if you already have a ticket is shorter and goes faster. It can happen, and I know this by personal experience, that even when you have the museum passes, and even when everybody has the ticket that means they can already get in. Annie: is it like the Sistine Chapel? Pushed up against everybody. Elyse: it could be like the Japanese pushers on the Metro in Tokyo. I don’t like that very much. So what happens is when you walk out you notice that all of a sudden around 1 o’clock in the afternoon that there is hardly any line at all. Because people get hungry. Annie: French people anyway will leave. They’ll go after lunch. Elyse: French people leave, and the other people guess what they’re going to go? They go into the Park because, this is what I want to say, because now having been to Versailles I’d say 22 times, the more I go, the more I appreciate the Park. And the Park is splendid, it is so beautiful, it is so wonderful, it is so big. You cannot appreciate the Park in the dead of winter because Versailles is chillier than Paris, there’s a bit of a wind there, it’s humid, it’s cold. You have to be really dressed for winter. However, if you go in the spring, if you go in the autumn, if you go in the summer time, you can spend two hours in the Château, I can’t imagine spending really more than that to be honest, and you can spend the rest of the day in the park. There are snack places where you can get a sandwich, a crêpe, an ice cream cone, a coffee, anything like that. There are two restaurants, nice restaurants, there are two other small restaurants kind of hidden away in the woods, you can bring a picnic into the Park, you can rent a bicycle, you can rent a tandem bicycle, you can rent a golf cart that seats four, and electric cart, you can pay to get the little choo-choo train that goes all the way around the park and you can get on and off whatever you want.You can rowe, you can rent a boat and roll on one of the two magnificent lakes that are set up, they are geometric but they are actually lakes, you can go to heaven in this park. And the fountains have been or are in the process of being restored, the last time they were just fixing up the magnificent fountain that’s just below the steps leading outside of the Château, which is absolutely exquisite and in fact it has copper tubing underneath that at the time it was made was the latest invention, it was just incredible the system that they created. All of this is because the park is becoming more and more popular, and it really is a fabulous thing to see. Annie: so is it a separate ticket for the Park and the Château? Elyse: if you want to go only to the park, you do not have to pay. You can go in the side entrance that takes you directly into the Park, except for the days where they have the waterworks shows. 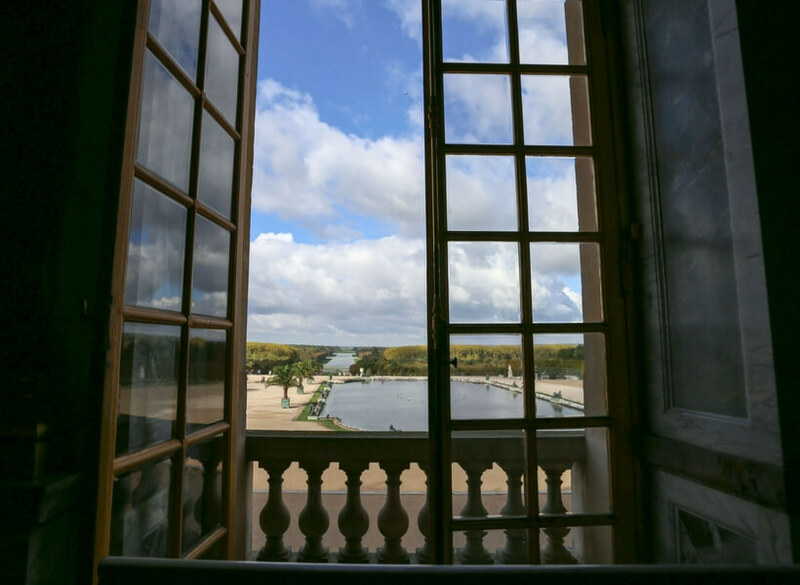 Now, in the summer there’s, now they have restored most of the waterworks, there are from the end of March to the end of October, there are certain days you have to find out there are different schedules when there are waterworks, what they called the “grandes eaux”. They have fountain shows, and they are during the day, and these are really nice, they are beautiful, however, this is what I want to go back for, because this is what I have not done, in July and August for €22, you can go to the nighttime show. Which means that you will get to see the fire and waterworks the way with Louis XIV did, with the Baroque music composed by people like Lulli and a whole performance that will take you back to we the 14th. Annie: oh that would be really good. Elyse: and this is just a fabulous thing to do. It’s really beautiful. Elyse: it’s not as crowded, because otherwise the Park is free during the day and of course you don’t even have to rent a vehicle if you just want to walk around. I have a friend he and his wife and their child they take their bikes, they go out by train, they bring a picnic, and they spend the day in Versailles Park. And it’s really fabulous. It’s really a spectacular thing to do. 54:00′ Elyse: I think that most people don’t realize what Versailles until they go. 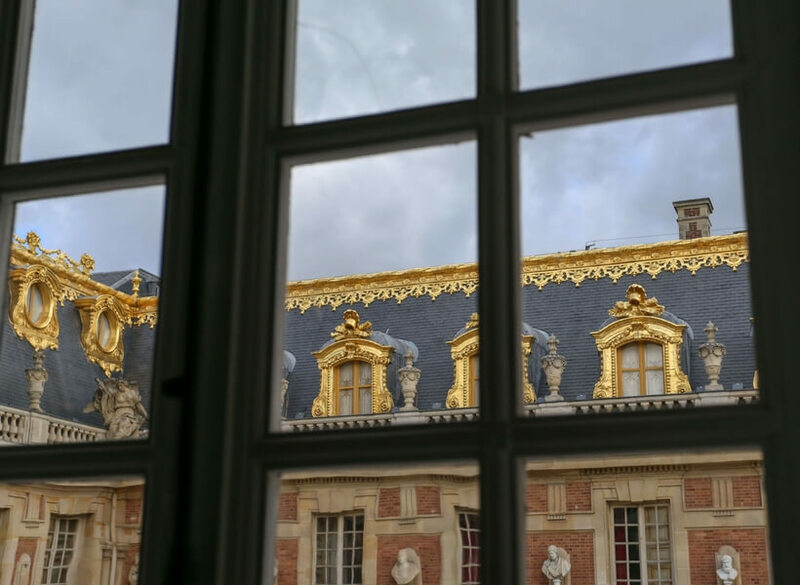 But of course, I think it’s also true that unless you hear about the history of Versailles, is just as you said, one of those over-the-top extravagant, not necessarily modern taste, buildings, you know. Elyse: it was pretty miserable for a lot of people that’s right. Annie: and then, you show up at a place like Versailles, which is stunning how beautiful and all over the top it is. Annie: oh, honestly I think it is shocking! Yeah, it is shocking what they did! And they got away with it, all the kings all over Europe. Elyse: but Louis XIV and Versailles is the extreme example, he got away with it more than other places. By the way, it was in Versailles that the final treaties were signed for World War II. Annie: yes, le traité de Versailles. Elyse: De Gaule of course made it an important place symbolically after World War II was over, it’s a place that still has huge symbolic significance for French people, even those who couldn’t care less about the King. 55:00′ Elyse: and just one last thing, how to get there? Well, that’s really easy. The suburban timeline, the RER, C, the C train, all the trains in Paris, all the suburban lines, instead of having numbers they have names, they have abbreviated names. This is a train you get on the left bank of the Seine River. You can get it at Saint Michel, you can get it at the Eiffel Tower, you can get it at the Orsay stop, there are a series of stops along the left bank where you can get on this train it costs €6.40 round-trip, it’s about a half an hour, and it gets you off about two big blocks away from the Château. It’s really worth taking the train. Don’t try to park. Annie: don’t park, you’ll hate it, you’ll pay a fortune for parking, and you’re going to be walking more just to get back to your car. It’s kind of like one of those Disneyland parking situations where you are 3 miles away from the entrance. Elyse: and you might not even get a parking space. If you have to park in a metered spot in town, it’s even worse. Annie: yes, that’s terrible, because then you have to go back every two hours to feed the meter. Elyse: of course we all know that in France you get a fine, and you get towed it pretty quickly. Annie: and then you a competition with my cousin who lives in the site and complains about the parking, he has private parking at home, but when he’s outside there are people everywhere. Elyse: but the train is really very efficient and they go all the time. You just have to make sure that when you get on the platform they list the destinations, the stops that are coming up, just make sure that it says Versailles Château. Because there are actually two different things in Versailles, but you want the train, it’s the last stop, it’s really easy, just make sure it’s the train that says Versailles Château, and that’s it, you get on, you get off, it gets back the other way, you can even get off at different stops on the way back. Annie: there are probably dozens and dozens of trains every day, there probably trains every 10 minutes, every 20 minutes okay. Elyse: every 20 minutes, so you get off the train, and you won’t be alone. Annie: are these the big double-decker trains? Elyse: yes, these are the big double-decker suburban trains. So it’s really really easy to do it that way. Just be sure to wear comfortable shoes, these are cobblestone streets, the courtyard which is enormous which leads you to the entranceway into the Château, which is fabulous because you get this fabulous view with its on a slight incline of the hill, as you turn the corner, you see this humongous thing with this “grille” work that’s all covered with gold, and then you see the gold on top of part of the Château, but it’s all cobblestones and it’s really really hard on your feet if you don’t wear comfortable shoes. Annie: it’s probably pretty difficult with a wheelchair too. Elyse: it is difficult with a wheelchair. There is as central little lane that is a basic sidewalk, but other than that since there are so many thousands of people come and go all the time you have to be careful. And then of course once you’re in the Château the grounds itself are not cobblestone so it’s a little bit easier and, believe it or not, Versailles Park is a park where you can sit on the grass. So you don’t have to worry about being chased around, being told that you sit on the bench. Annie: yes it’s good so you can bring a picnic, you can bring your bikes. Elyse: you can do all of that. Just know that if you are going to bring a backpack with a picnic, if you’re going to go into the Château, you will have to put that in a locker space because they don’t want to go into the Château, first of all if you have a backpack considering how crowded it is you cannot do that, and they don’t particularly want people to go into the Château with food. You can bring a bottle of water, I I’ve been going with a bottle of water and some cookies or something like that they don’t bother you, it doesn’t matter, as long as you don’t have some kind of big backpack, in which case it becomes another kind of a problem. Annie: photography, is it allowed in the Château? Do you remember? Elyse: photography, no flash, no photography in the rooms but photography in the Park. Annie: but they do have lockers. So if you show up with an expensive camera, will they rent you a locker? Elyse: now, that’s a good question. They don’t usually like you to put expensive cameras in the lockers, no you wear it around your neck. You just don’t take pictures. And they don’t want you putting cameras in the lockers because it becomes their liability, and they don’t want that. However, the guards are very very very observant and you really cannot take pictures inside. I mean, I should, I’m a little hesitant to say no pictures at all or pictures without flash. There are certain rooms where you can take some pictures without a flash but they’ll tell you when you go inside. But my suggestion is if you have a very visible camera, keep it around your neck anyway. Which reminds me of one last thing, which are usually don’t talk about but, you have to be careful about pickpockets. This is a very crowded space, obviously you’re going there with the idea that you’re going there to have a good time, and see beautiful things, but you know you better be careful. This is the perfect place for people with bad intentions, all the have to do is be nicely dressed, get the audio phone just like you, if you have people pushing up behind you and people on your side you might not even feel it, so keep your bags closed under your arm and don’t have anything visible that can be taken out of the pocket. But not to and on a note of that, I would like just to say that Versailles is splendid, it’s the word I would like to use. Annie: do you think it’s worth taking the time? If you’re in Paris for a week for instance? Elyse: if you’re in Paris for a week, you go to Versailles. Absolutely. If you’re in Paris for two days, I would say no, because you cannot go for less than a half a day, but it’s a question of priorities. But a week, yes, you can take a half a day you can take us three quarters of a day because you can take the train back and get off at the Eiffel Tower. And that is your perfect day. Annie: which in France it would be daylight until 10 PM or 10:30 PM in the summer. Elyse: in June and July for sure. And then you can take a train back and you can get off and visit the Eiffel Tower. Annie: that sounds really good! Elyse: sounds like a good day, hum? Annie: it does sound like a wonderful day, a bit tiring, but a good day. Elyse: oh, but you’re supposed to be tired when you’re a tourist. 1:04:00′ Annie: well, we’ve broken one hour, this show is going to be our longest one ever, but it was well worth it. We have to decide:, or do we give you the full treatment? I think it’s better to not cut it up. Maybe you could give us some feedback about that. Go to the website and let us know if you would prefer shorter episodes, or if the length of the episode is irrelevant. Because you know, you’re probably using in your car, probably on your commute, and you can pause it. Elyse: yeah, you can’t pause me but you can pause it! Annie: ha ha ha, nobody can pause you Elyse! Elyse: but really, if you would like us to be a little bit shorter, a little bit more structured, do let us know. Annie: yes, although I do like the structure just fine as it is. And another thing I love is iTunes reviews, reviews and Stitcher Radio and we love you for it, and we’re looking forward to talking to you again next Saturday! Thank you very much, et au revoir! Post-Show Note: Elyse was right, that’s how long he lived, not how long he reigned “His reign of 72 years and 110 days is the longest of any and all monarch of a major country in European history.” Wikipedia article.